About Danny Allen – 1946 – 1974. 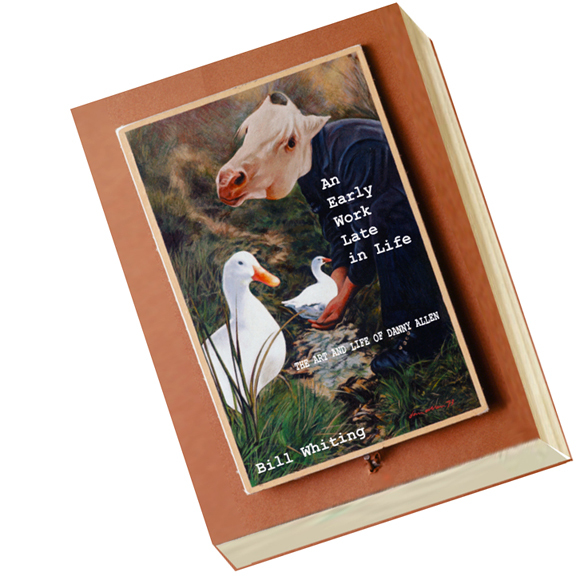 A book about the art and life of Danny Allen is due out mid-March 2013. Properly framing artwork is one of those things that can only be done correctly when you’ve got access to the the right equipment and workspace. When framing Danny Allen’s drawing The Egyptian, I wanted to accentuate his strong use of line. I also wanted to “float” the drawing within a mat contrasting it against a backing board rather than using a mat that was laid on top of the edges of the drawing. Some of Dan’s line work comes almost to the edge of the paper. Also some of the edges of the paper are torn–and curiously enough I kind of liked allowing all those edges to show. The technique for floating a piece like this is tricky. 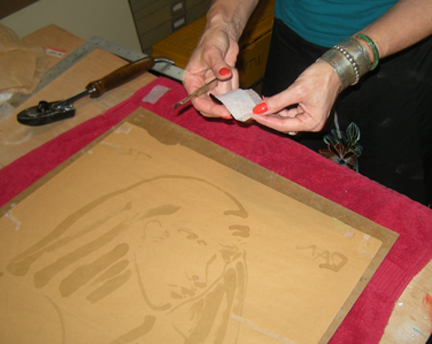 The conservator applied tabs to the back of the drawing–but since the mat wasn’t going to cover the edges of the drawing, slits had to be accurately cut into the backing board and the tabs fed through the board and taped in place on the reverse side. 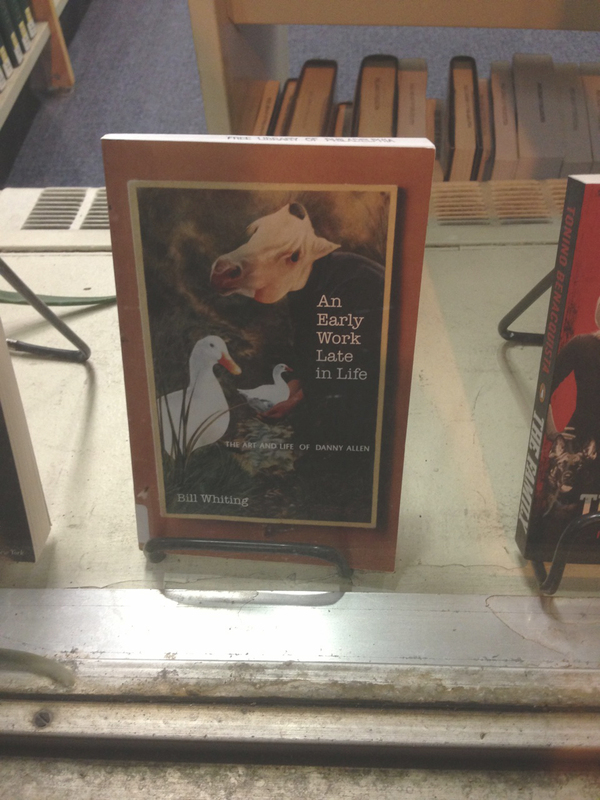 In the window of one of the Philadelphia Public Library branches (Rittenhouse Square). Today I’m taking my small victory laps where I can. Last night I received an email from my friend, Arden Kass, who is a very respected and talented Philadelphia writer and playwright. She was walking past the Rittenhouse Square branch of the Philadelphia Public Library and noticed that my book is featured in the window. I’m not sure how they acquired it, but I’m not asking any questions. I’m just glad to see that it’s available to library goers. I’m still working on digitizing the book to make it available online for readers who prefer computerized devices to turning paper ages. Only a very few printed copies remain available. The digitized version will require some redesign to make it fit into the necessary formats. 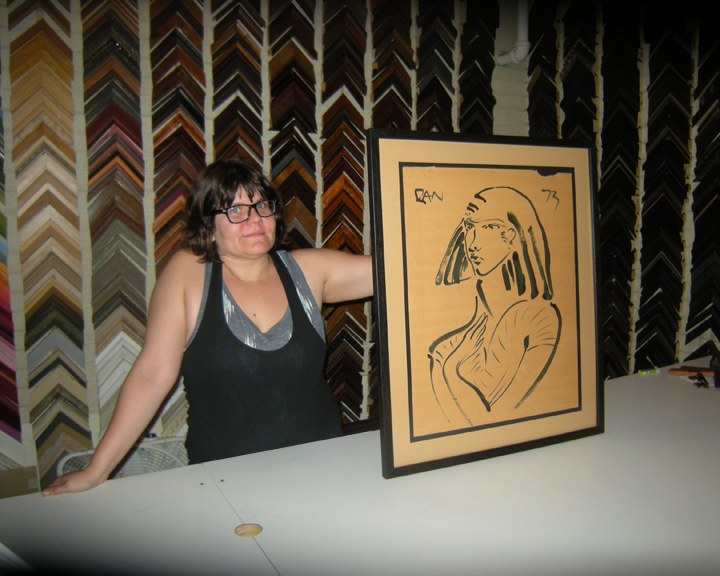 Danny Allen’s 1973 India ink drawing, ‘The Egyptian’ being inspected while still under Plexiglas from the original frame in which it arrived. 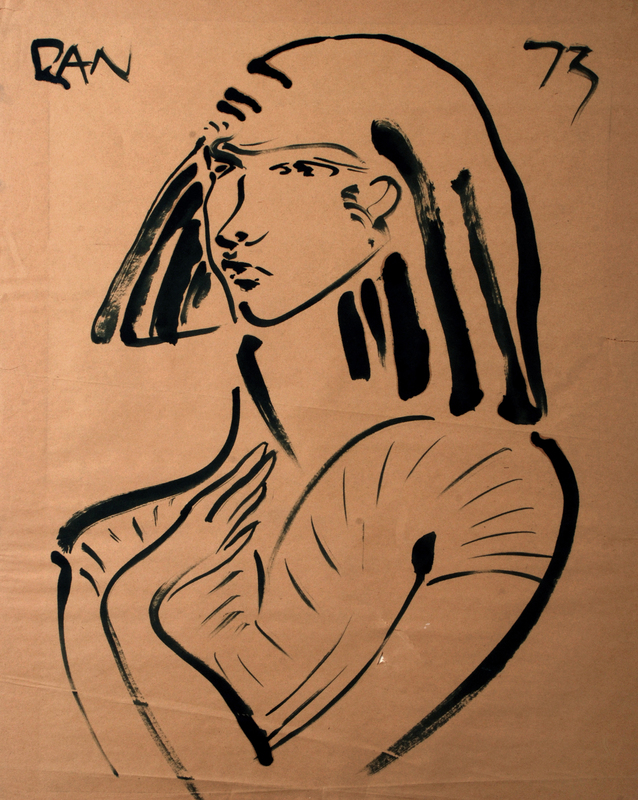 One of my favorite drawings from Dan’s portfolio is a quick India ink sketch he did titled The Egyptian. I received this drawing as a gift twenty years after Dan died. It arrived at my home via FedEx out of the blue with no immediate explanation. The sequence of events as to how all that came about is covered in the book. This is a treasured piece for me, and it needed and warranted conservation. 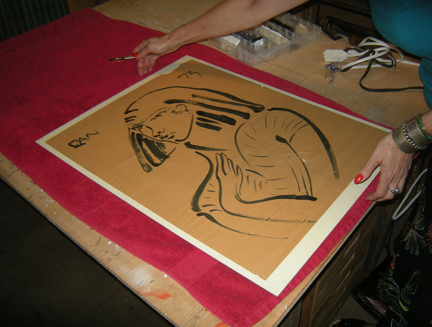 Susan carefully checks the strength of the paper and decides to utilize the existing backing and Plexiglas to flip the drawing so that she can safely have access to the back of the piece to mend any weaknesses and tears. The drawing was framed poorly when I received it, but I wasn’t in a position to make any changes to it. 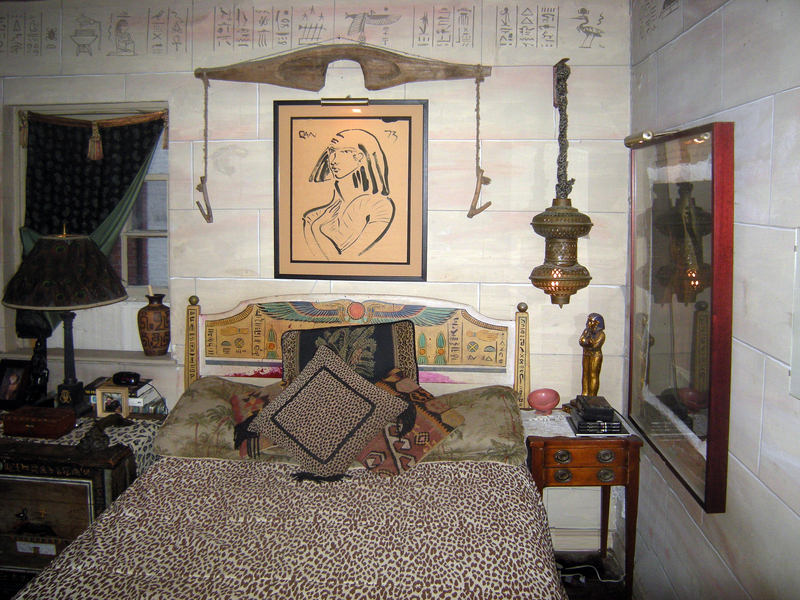 It wasn’t until I unframed the art to have it photographed for the book that I realized what poor condition it was in. I contacted a local paper conservator named Susan Duhl to do the repairs. She very kindly agreed to perform the conservation in my studio so I could photograph her at work. Heat sensitive mending tissue is applied to the back of the drawing to bring torn edges together. The mending tape is reversible should there ever be a reason in the future to remove or replace it. This particular mend required access both from the front and the back of the drawing, but none of the mending tissue will show. There are certain codes of ethics that apply with conservation–most notably that one does no harm, and whatever repairs are made must be reversible. There were a variety of issues happening to this drawing: creases, tears and a chemical interaction with the old mat-board originally used as a backing. In fact there was a ghost image of the drawing on the now discarded mat showing how the acids in the old board had interacted with the paper and the ink. The drawing is very, very fragile. 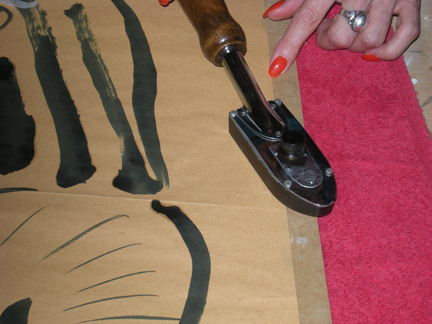 Mending tissue is also used to create “hinges” for the framer to use to invisibly adhere the drawing to it’s new backing board. Note how the India ink shows clear through to the back of the paper. The ink and the old mat board were having an acidic reaction to each other. The new backing my framer will use will be acid-free. 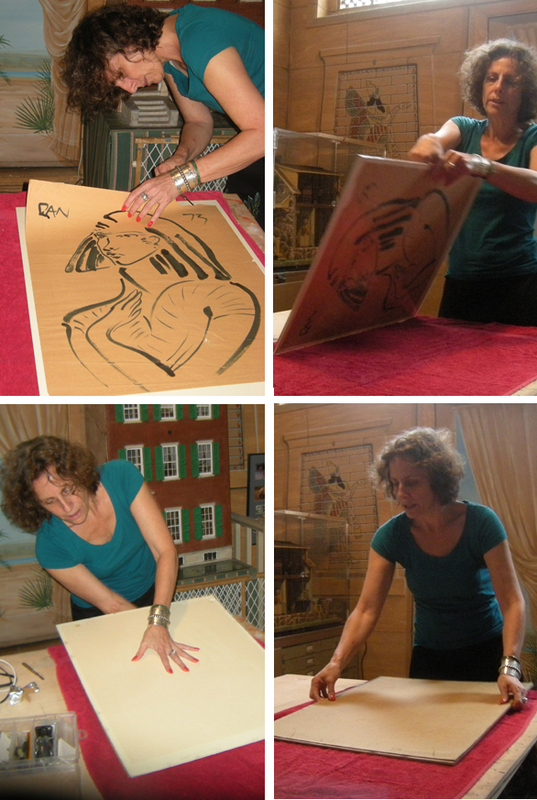 While it may look as if Susan is merely taping the drawing together, it’s much more than that. She used a heat-sensitive mending tissue that can be removed in the future if necessary. It’s also a tissue that does not discolor the paper. I Wonder What Took Me So Long? 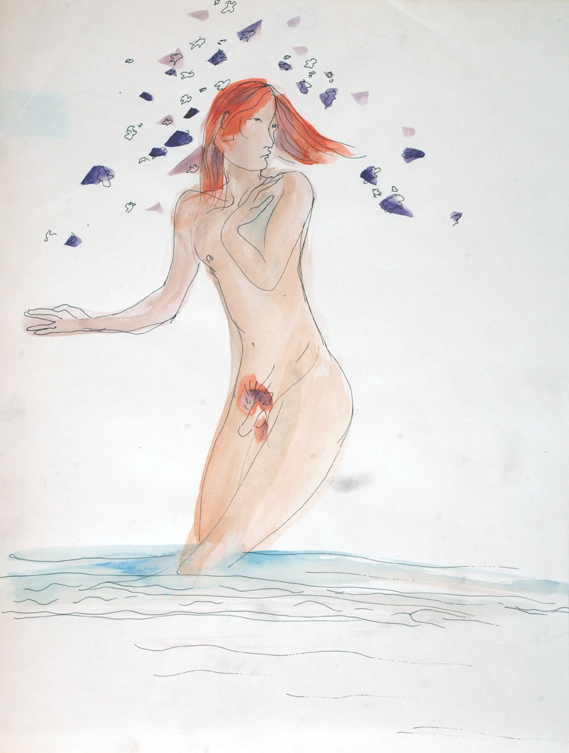 I wonder what took me so long to get around to properly framing Danny Allen’s watercolor of me displaying my birthday suit during my long-gone and misspent youth? Perhaps I was deferring to a shyness I once had but subsequently dismissed. More likely it was a case of having overlooked how much this drawing really meant to me–up until I gave Dan’s portfolio back to the Allen family. Like the work returned to the Allen’s this past July, this piece along with the other pieces I’ve kept, will eventually go back to Dan’s family. I remain the keeper now of only a few sentimental pieces that have tremendous meaning for me–but would be of no real interest to my own heirs. It’s odd to think of myself now as having once been an optimistic if not totally naive hippie with long hair and youthful, unrealistic life expectations. A gray old man stares back at me in the mirror–an old man who wouldn’t be caught dead skinny dipping in broad daylight. Perhaps I should work on that…. Currently I’m working on digitizing the book to make it available to a larger audience. I’m looking into online publishing options now, and hope to have more information in the near future. 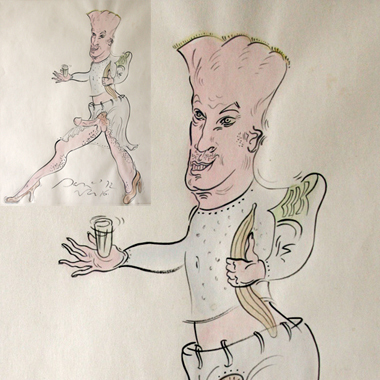 Previously undocumented artwork by Danny Allen keeps surfacing. Much of it is very psychological in nature, more often than not, focusing on gender identity. 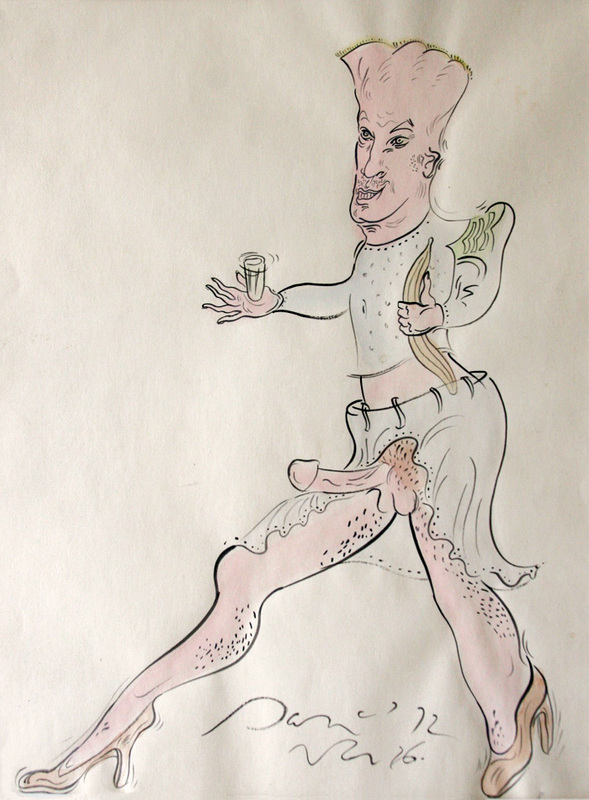 This particular watercolor is of a hydrocephalic drag queen with one club foot. It’s a troubling image to say the least. Back when I was living with Dan, there was a limited theatrical release of the 1932 horror film classic, Freaks. Dan was influenced by that film. Most of the characters in the movie were real-life individuals with birth defects and various abnormalities that made the more physically fortunate among us extremely uncomfortable–which to some degree was the point. For some reason that film resonated with Dan and his fascination with all that is outside of our collective comfort zone. One “freak” image already in the book depicts a pregnant man with an erection, and a bearded man/woman in a bikini. They appear to be playing ‘doctor’ as the figure to the viewer’s right is handing two pomegranates to the pregnant male/female figure to the left. Strawberries are floating on the wallpaper above the wainscoting behind the couple. There was green wainscoting in our first apartment with strawberries on fabric covering the walls in our the bathroom. To call the pieces in this post “unusual” is to employ understatement to the extreme. Danny Allen, watercolor, ca. 1972. Collection of Adele F. McCarthy. Another example of the “freak” series was located after the book went to press. 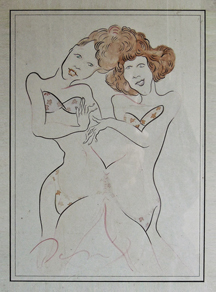 This example shows a pair of Siamese twins in a polka dot bikini for two. The sisters are attached at the hip and the hairstyle. I can only speculate about how the invention of these unusual figures resonated with Dan and his feelings of disenfranchisement. I believe Danny had very low self-esteem and identified with the outsiders he chose to conjure-up from his imagination. It’s only my opinion, as we’ll never know for sure, but I believe Dan felt profoundly out of place and misunderstood–bouncing back and forth from the bizarre to the beautiful and expressing it through his art. This is the newly located piec in its entirety. I won’t be publishing it on the Kickstarter blog or on Facebook. I think it would generate too much controversy. Pencil drawing attributed to Danny Allen. Unsigned and undated–probably from the late 1960s. Work continues to surface, and I’m awaiting a scan of a watercolor from a collection in New York. Shortly before Danny Allen’s sister and brother in law came down to Philadelphia to collect up Dan’s portfolios, I went through them one last time to look at everything and make sure it was all in order. There was a small section of drawings that weren’t Dan’s. There were only a couple drawings in the folio that weren’t Danny’s work–but rather were things done by college friends of mine that had just somehow found their way into Dan’s portfolio. As I went to remove the pieces by other artists I took a closer look at a particualr piece I’d never before considered to be by Danny, but I’ve since changed my mind. Digitally darkened detail of the face and animal. 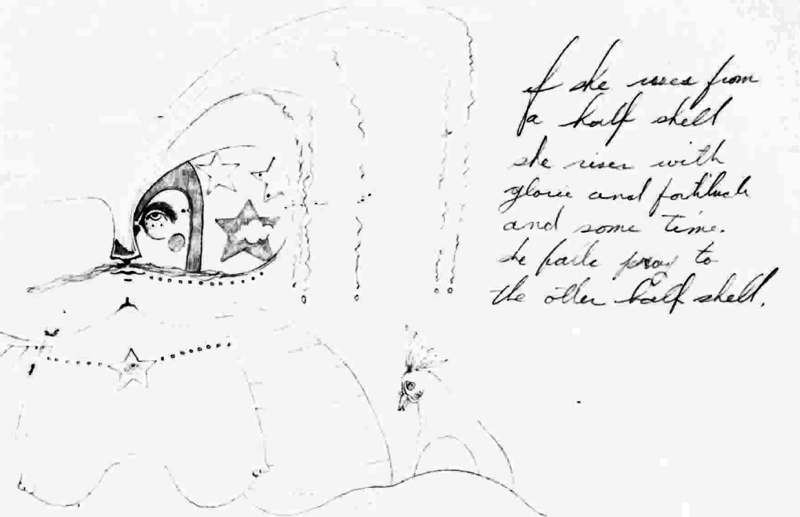 Note: Other poems by Danny Allen reference Botticelli’s ‘Venus” but I don’t see the relationship to the drawing itself. 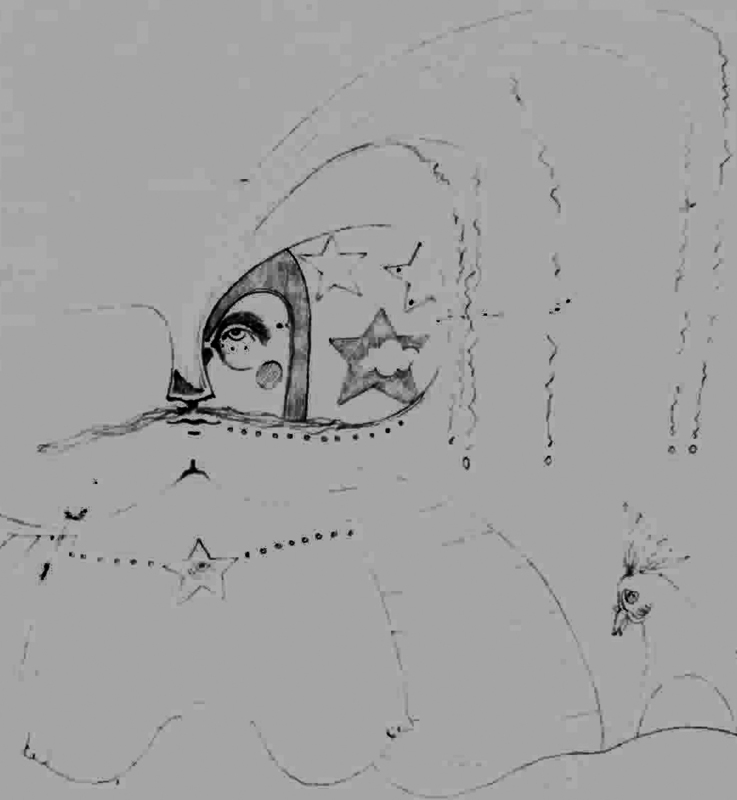 The drawing looks to me like a man wearing a helmet and the start of a pony or unicorn off to the viewer’s lower right. Danny Allen, watercolor of Bill Whiting, unsigned and undated, ca. 1972. I had a wonderful visit with Dan’s sister, Christine and her husband, Art. We had a very specific agenda–to return almost all of Danny work to the Allen family. I’ve asked to keep three pieces that have a particular sentimental value for me, but I now consider those pieces to be on loan from the Allen family. The piece shown above is currently at the framer. Chris and I discussed trying to put together a retrospective of Dan’s work, but no particular location has been selected. Christine likes to cut mats, so she certainly has her work cut out for her–there are a lot of pieces of art to be matted and framed. I greatly enjoyed my time with Chris and Art, and I loved getting to walk them from pillar to post showing them the historic sites here in Philadelphia. I only live a couple blocks away from some of the most famous places in early American history. Danny Allen, India ink on newsprint, 1973. 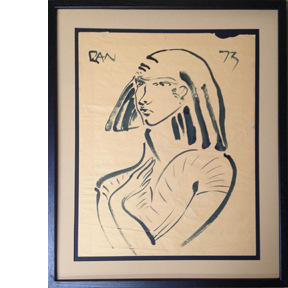 But back to Dan’s art… One of Dan’s pieces that I’m particularly fond of is a drawing of an Egyptian done in India ink on newsprint. That piece has a hairline tear down the middle, and I’d like to keep it at least until I’ve found a proper paper conservator to repair the damage. It doesn’t show while in the frame, but the tear was discovered when I unframed it to have it photographed for the book. I’m not sure what a conservator will do, but I’m thinking they would most likely add a fine linen backing or something similar to strengthen the brittle old paper. This piece took a very circuitous route to find it’s way back into my hands after a series of different owners. That story is covered in the book. Danny Allen, unsigned and undated, ca. 1974. The final piece I’m keeping for the time-being is an unfinished acrylic of a young man kissing a orchid. I’ve always loved this painting, and have it framed in a lined shadowbox so the painting itself floats as if hovering in midair. Handing over Dan’s art back to his family is another giant step in healing and moving forward–and long overdue. I believe the final puzzle piece for my own personal bucket list of accomplishments would be a retrospective of Dan’s art. we’ll find a way to make it happen.